Hello again dear Friends! Its Monday and that means its time for a new House Mouse & Friends Monday Challenge. We are to create monotone/monochromatic/monochrome cards. 3. the state or condition of being painted, decorated, etc., in shades of a single color. 4. being or made in the shades of a single color: a blue monochrome seascape. 5. having the images reproduced in tones of gray: monochrome television. Stamps: Stampabilities, House-Mouse Designs, Inc., "Having A Ball", #HMC1005, featuring Mudpie, from the year 2003. This is gorgeous, love the colors and the design. Told you so!!! I knew you'd come up with something astounding, I could never be brave enough to do a monochrome in RED!!! 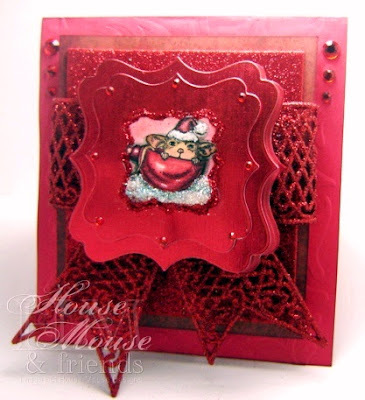 I love the die, it's a fabulous shape, your colouring is as usual -awesome and that ribbon is to 'die for'- gorgeous card!!! Wowzer HM creation GF picking me jaw off the floor amazing colour combo how brave you are to use RED..dont know why you think the pics no good looks fine to me..love those frames....its truly GORGEOUS.. Stunning! very brave with the color and the result is stunning! thanks for playing along with us at CCCB! What a beautiful card.. The little image is to cute.. Thanks so much for playing along with us at CCCB! Welcome back to crafting!! Woo hoo!1 This is gorgeous America!! I so love your colors and the coloring of the sweet HM image!! So glad to be able to see your gorgeous creations again!! Really gorgeous! Love the red, it's one of my favorite colors! Awww, that little Santa mouse is adorable! Thanks for a great challenge this week! You did an amazing job with this card. I love all the red shiny and glimmery papers. It looks so gorgeous and is relly great for christmas.